The Dota 2 Tournament ESL One 2017 Major in Hamburg is the first major tournament after TI7, although it still takes some time until the tournament starts, the big Esports betting sites have already started publishing their bets and odds. There are only a few bets that are already online, but it indicates that they will post more bets as the tournament approaches. In addition, the ESL One is now a Major in the new tournament format of Dota 2. Depending on the results, the teams receive a certain number of points that are important for a direct invitation to The International 2018. Therefore, it is much more important for the teams to maintain a consistently good form. And for us as the spectators, it becomes more and more exciting. If you want to be even more thrilling, you can get an additional thrill with the bets on Dota 2. Let's take a look at the bets that already exist for the ESL One 2017 Hamburg. In the run-up there exists one bet with the big Esport-betting providers. 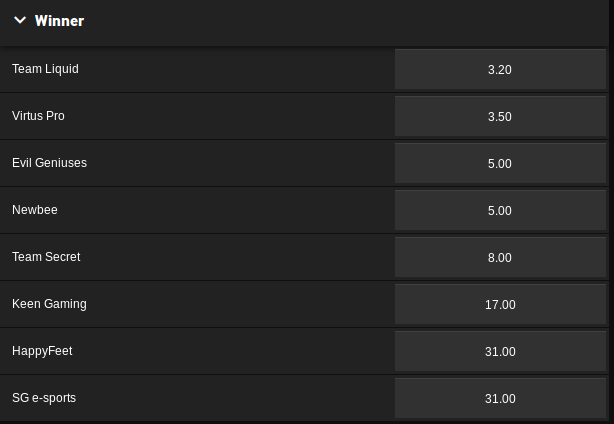 This is THE classic bet that is available for almost every tournament. However, this does not change their popularity. I'm talking about the overall winner – bet. Popular at all times, this bet provides extra thrills as you follow the ESL One Hamburg 2017. If you are sure that your favourite team will win the ESL One 2017, then this is the right bet for you. You must place your bet before the tournament starts. Afterwards, it's up to your chosen team to put its all into it. The teams have very different odds, depending on their form to date. HappyFeet and Keen Gaming 2 teams are waiting for us in the international arena, and their odds are high. There is clearly a favourite in Team Liquid who won the TI7 a few months ago. It is interesting to note that Virtus. pro is rated much higher than Newbee. Newbee also made a convincing TI7 finish and finished in an impressive second place, having dominated the entire tournament.